Add this vanity to your bathroom for more modern style in your home. Made with a special brown fiberboard base and a white artificial stone counter, this piece will make your bathroom look even nicer. Keep many bathroom items in its roomy drawers and double-door cabinet. Put a classic feel in your bathroom with this good-looking set from Wyndham Collection. Bring a fresh, modern look into your bathroom with this vanity. The white artificial stone counter and brown fiberboard base make this piece great for any bathroom. With a double-door cabinet and drawers, this vanity can hold all kinds of bathroom items. Make your bathroom look like new with this good-looking, useful set from Wyndham Collection. Designed with a modern style and strong build, this vanity is a perfect choice for any bathroom. Its white artificial stone counter and brown fiberboard base are very easy on the eyes. Made with a roomy double-door cabinet and drawers, this vanity has lots of room to keep items like toothpaste, towels, and hair brushes. Put a nice twist on your bathroom project with this classic piece from Wyndham Collection. With a modern look and strong design, this vanity will help any bathroom look nicer. The white artificial stone counter and brown fiberboard base make a beautiful look in your bathroom. Made with a roomy double-door cabinet and drawers, this vanity has lots of room to keep items like toothpaste, towels, and hair brushes. Put together your perfect bathroom with this stylish vanity set from Wyndham Collection. Enjoy the popular modern look in your bathroom with this beautiful vanity. Its comes with a nice white artificial stone counter and brown fiberboard base for strength and style. Made with a roomy double-door cabinet and drawers, this vanity has lots of room to keep items like toothpaste, towels, and hair brushes. Make your bathroom look like new with this good-looking, useful set from Wyndham Collection. 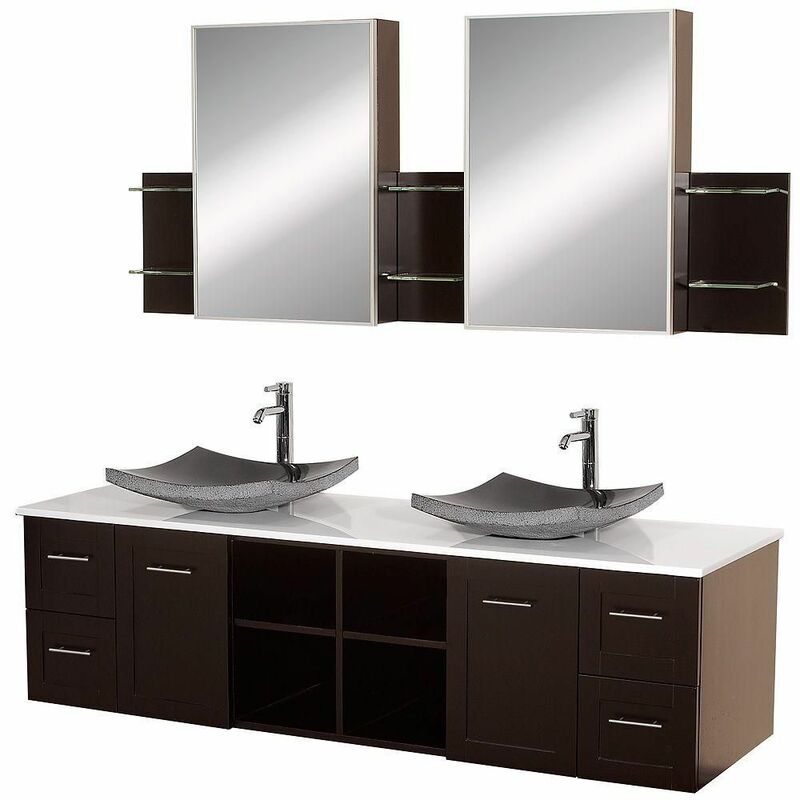 Avara 72-inch W 4-Drawer 2-Door Vanity in Brown With Artificial Stone Top in White, Double Basins Add this vanity to your bathroom for more modern style in your home. Made with a special brown fiberboard base and a white artificial stone counter, this piece will make your bathroom look even nicer. Keep many bathroom items in its roomy drawers and double-door cabinet. Put a classic feel in your bathroom with this good-looking set from Wyndham Collection.